Track Your Speed Post Parcel quickly by using our Fast,Secure and Reliable Speed Post tracking service which provide current speed post tracking status of the consignment. Tracking Speed Post parcel is totally free .Our Speed Post Tracking Service is secure as well as less time-consuming. Because we realy don’t collect any personal information or store any type of Tracking Number or User Information . Enter the speed post tracking number of your package and click the track button to get the current courier status. The Indian post office offers two types of mail services. They are domestic and international. The express mail service (EMS) is for international mail and the other mail like ordinary post are for domestic ones. Follow the step-by-step process below to check the status of India post tracking. Mail Tracking Number: It is the consignment number printed on the parcel booking receipt. Tracking Type: You need to select the speed post international option for tracking EMS parcel and domestic for tracking other parcel.Enter the speed post Article Number/Consignment Number/Reference Number/Post Office Tracking Number/Postal Tracking and click on the track speed post button. The delivery status will be displayed here. Status via SMS: You can also track the mail/parcel status by sending an SMS message to 166 or 51969. The format of the message is POST TRACK <TRACKING NUMBER>. 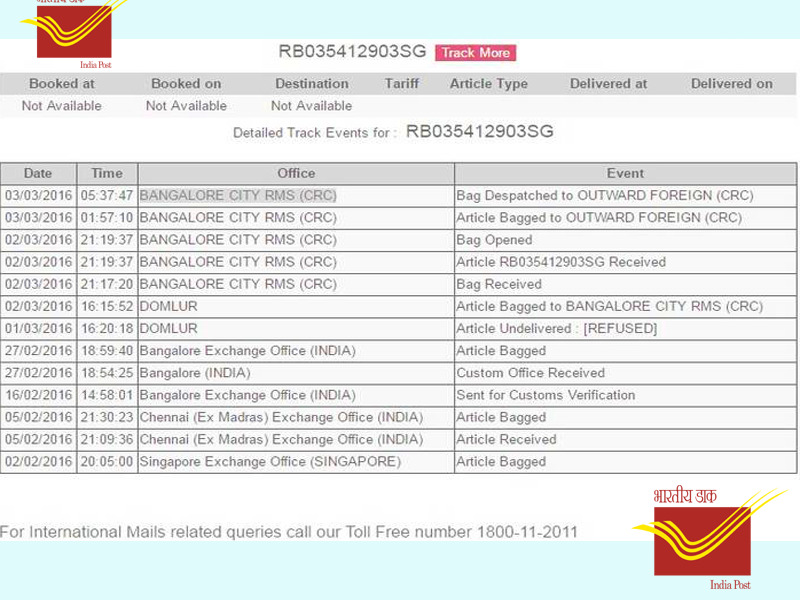 You can also track the details of the courier on the official site, www.indiapost.gov.in. Check the IndiaPost for more information. Having a good information on the type of mails is very much essential as it will be helpful on what type of letter to send. There are quite a bit different types of mails that can be sent via the India post. Here the top 5 mailers are shown. Speed Post: The popular and fastest means to send the letters and covers. EMS: Send parcels to nearly 200 international countries. Ordinary mail: Send documents which are not important. letters and postcards fall in this category which are sent regularly. Registered letter: Official documents are sent and records are maintained as a proof. Value added services: This is good for eCommerce solution which deals with COD feature. As the name itself indicates it is a speed service and the consignment is delivered within 2 to 3 days. This is a cheaper service compared to that offered by many reputed courier companies. Indian postal department maintains records about the letter status at each interval and updates the information in its database. Whenever the customer asks for the delivery status, it can be retrieved from its database store. The speed courier offers many advantages over the ordinary one. However, the only con of this service is that the price is a bit high compared to that of the normal postcard. The package is delivered quickly in less than 3 days across the country. The documents are delivered with high safety and security. The records of proof of delivery are maintained by the postal office. The parcel is delivered to the mentioned address and in case if the addressee is not available, the mail is returned to the sender. The trackable number is different for each type of mail service. The below table shows the different formats. Use the speed post tracking feature and know the status of your consignment. If you have any trouble in checking, then contact the Indian post office customer care. India post office has a good historical record. It's been there for many years when there no private mail services at all. It is a very cheap service that you can choose at the quality of what other leading courier companies are offering. It provides reliable services at an affordable cost. It has a wide reachability across all parts of India. One can even send a letter to a remote village in India.